Saturdays are always hectic around here, when we’re rushing around to take care of a week’s errands, running off to the CSA farm to pick up our weekly share and pick whatever’s available from the fields, cleaning the house and attending various events. Phew. So this weekend, when we were cleaning out our gardens for the final time and chopping up leaves for the compost heap, I made this simple and flavorful soup that used up some of our abundant kale. I made it with chicken broth that had been simmered with a smoked ham hock from my freezer, which imparted a smoky flavor. The more traditional – Portuguese –version would be to add chorizo. 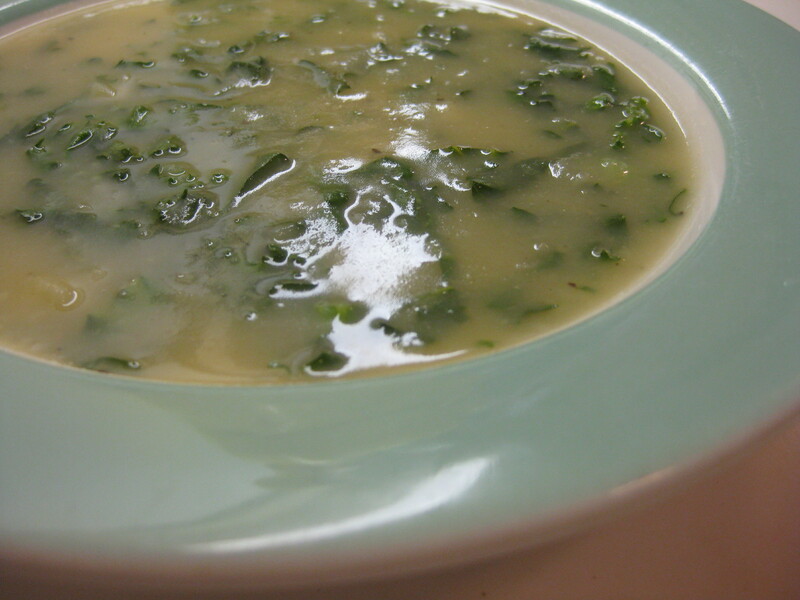 The soup could be made vegetarian simply by using vegetable stock, or even water. I chose to puree the potatoes but if you cut them small and neatly, they can be left whole, creating a rather different kind of soup. Saute the onion (or leek) and celery in the butter or oil until translucent, add potatoes and stir to coat. Add stock and simmer until the potatoes are soft. Puree the mixture and return to the pot. Add salt and pepper to taste. When ready to serve, add the slivered kale and cook for about 5 minutes or until the kale is tender.